If you have a big space to fill inside an expo hall or convention centre, then it’s absolutely important that the tension fabric displays you use make that space work and provide the maximum impact it can deliver on your target audience. You may think that such high-impact exhibits and displays cost a lot of money, but you’d be surprised to know that you can find some that will fit your needs without breaking your budget. Our 20ft pop-up displays are some of them. 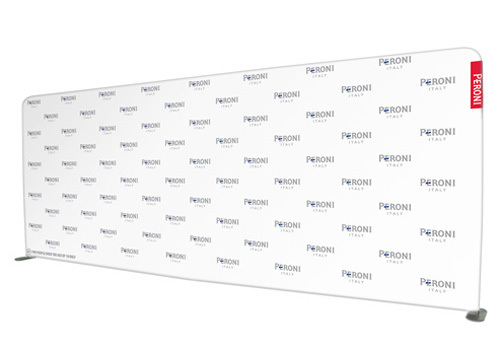 Our 20ft pop up tension fabric displays are models of simple elegance. They are visually appealing, and at the same time practical and versatile. They are great for decorating large stands at expos, but they can also be used for other purposes, such as backdrops or backgrounds for red carpet or corporate events, press meetings, theatre presentations, school formals, awards or graduation ceremonies, and even weddings. All our 20ft pop-up displays consist of at least two frames and a set of fabric graphics or graphic panels. The frames are made of aluminium. While we have set sizes for each frame, we can custom-make straight frames to any height and width of your choosing, and curved frames to any height. The graphics are done in full colour and are produced using the best and latest printing technologies available. Options 1 and 2 have frames made up of straight and curved pieces. The straight, tubular pieces are foldable and lock at the joints. Each piece has labels at both ends for easy assembly. Their fabric graphics work like pillowcases that you zip up closed. Options 3 to 6 have pop-up frames and graphic panels. You can select whether the graphic panel is to be made with fabric or laminated PVC, and you attach these panels to the frame using Velcro strips. Each package includes a set of halogen lights that you can use as a spotlight for your display. Also included are wheeled carry cases, which make these displays portable and easy to store. Wooden countertops and graphic wraps matching your graphic panels also come in the package. These accessories are used to convert the carry cases into counters that you can use as a workspace or for carrying your pamphlets and presentation items. For all that they are big, our 20ft pop up waveline displays are surprisingly easy to assemble and install. Installation takes only 15 minutes to complete. So they will save you time on setting up and leave you with more time to attend to other important tasks. To assemble Options 1 and 2, you only need to unfold and lock the straight pieces of the frames and connect them all together. Then you attach the centre poles to keep the frame stable. Lastly, you slip on the fabric graphic and then zip it up. To assemble Options 3 to 6, you only have to pop up the frame to allow it to expand to its full height and width. Then you attach the graphic panels using their Velcro strips. Aside from saving you time, our media walls and waveline displays will also save you money. For one, it’s because they’re versatile. As mentioned earlier, you can use it for different types of events. You can also break them up into two or three separate and smaller displays. This gives you more room to mix and match your displays, as well as to adjust them if space becomes an issue. For another, you can reuse these displays over and over again. You don’t have to buy a new frame-and-panel set whenever you need to put up a display. You can use the same frames and just order new graphic panels to go with them. Our 20ft pop up displays are the best solutions available in the market today. They are beautiful and versatile, and they will save you precious time and money. Based in Sydney, we can deliver these displays to just about any location in Australia, helping more people in more places get what they need to reach their audience. Call us right now for more details.